We used to call them "Discos" now they call them "Clubs". We used to call them "Bars" now they call them "Pubs". We used to go on Pub Crawls, now we just go and "hang" somewhere. Boy times have changed. So has the quality and variety of cocktails. Many restaurants have bars, but these are the standouts. When you want a brew, you go to Clocktower, the locals hangout. When you want to sip fine wine, you go to Side Door, for music and fun you're at Whiskey. To just hang with great music, try Lakanuki, if you want sports then Grumpy's. Hyde Lounge has rocking music. Mammoth brewed beer is one of the finest local microbrews and served at every restaurant in town. The Mammoth Brewing Company also has tastings, so you should come by after the day, and sample a few. The Mammoth bars are also known for their happy hours. Usually from 4:00 PM - 6:00 PM they want you to come in and get your party started early. From drinks to half price menu items, you can get adult beverages, whole meals, or just something to take off the hunger edge. Many have also started a late night happy hour starting sometime after the dinner rush. So if you're interested in getting out and off the sofa, check out these Mammoth Pubs, Clubs, Wine Bars, and Restaurants many with entertainment. 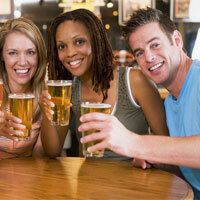 Here is City Concierge's pick for Bars in Mammoth Lakes. And don't forget to check out some of the other areas of Mammoth Lake dining guide American Food - Fine Dining - International Flavors - Pubs and Clubs - Breakfast and Lunch - Coffee Houses - Sweet Shops - Take Out and online menus for more selections.